For large gatherings or intimate get-togethers, Londonderry Country Club has the ideal space. The clubhouse overlooks the pristine and meticulously maintained golf course grounds, and our charming banquet facilities provide all of the amenities for making your special day unforgettable. You are guaranteed personalized attention throughout the planning of your event, including overseeing the actual function to ensure that every detail is flawlessly executed. For more information or to arrange a viewing of the rooms, please Contact Us or phone us at 603.432.9789 and ask for the Function Director. The upstairs banquet room has an elegant and inviting New England atmosphere with exposed wooden beams, a large fieldstone fireplace for cool days, oak wainscoting on the walls and a full-length birds-eye maple dance floor. For additional seating, stylish French doors open onto a wrap-around pine paneled porch that overlooks the picturesque golf course. A non-refundable deposit of $400.00 is required in order to secure your reservation. 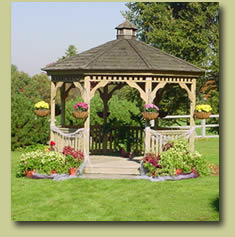 If photography is part of your event, plan to pose in our gazebo. The grounds are landscaped and planted with flowers. It’s a magical setting for wedding parties and group photos. You don’t need a camera to appreciate the gazebo, though. Retire there for intimate conversation or a moment of quiet solitude. The Nutfield Lounge downstairs has another fieldstone fireplace and an intimate space for conversations, cards and relaxing time with friends and family. Please contact our function director at (603) 432-9789 for a list of authorized caterers who will be able to provide you with a complete menu selection. You may designate whether you prefer a cash or open bar; we provide bartending staff. Set-ups, deliveries, decorating, etc. may take place two hours prior to the start of the function.